Scruggs-style banjo playing is based around creating music that uniquely combines the elements of left-hand slides, hammer-ons, and pull-offs to the right-hand roll patterns. As you listen to and play pieces in this style, you may begin to notice short phrases that appear in more than one tune. 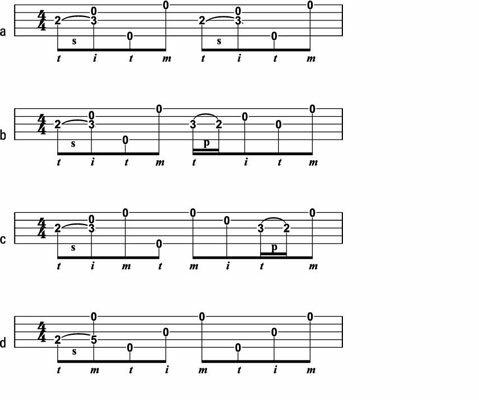 These phrases, called licks, are the building blocks of Scruggs-style banjo. A short phrase that can be lifted out of one tune and played in another is called a lick (a hot lick is a particularly great-sounding phrase). Licks are used in melodic and single-string playing as well, but are especially at home in Scruggs style. Licks make your playing sound more interesting and varied and are essential elements to improvising on the banjo. You can sometimes use licks as part of a melody, but often licks stand by themselves as good things to play on the banjo even when they aren’t necessarily related to the melody of the song that’s being played. Becoming comfortable integrating licks into melodies and knowing which licks can be used at what points in a song takes a lot of hours of hands-on playing experience and a lot of listening to other good banjo players. To get started on your journey to becoming a great bluegrass player, all you need to do is play as much as possible, have an open mind, keep it fun, and try as many different things as your practice time allows. Really, the only mistake you can make is to stop playing! The more time you devote to playing, the more everything falls into place. Licks are almost always associated with chords. For example, you play G licks at that part of the song where the accompaniment is a G chord; you use C licks when everyone else is playing a C chord, and so on. Figure out the right-hand pattern indicated in the tab and practice this by itself until it sounds steady and solid. If you can memorize the right-hand sequence as you play, all the better! Add whatever left-hand techniques the tab shows (slides, hammer-ons, or pull-offs) while maintaining a solid rhythm in your right hand. 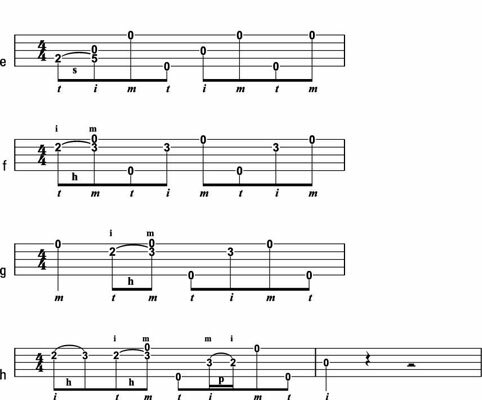 The best way to figure out whether a lick works in a particular place in a song is to try it and see what happens. You usually know pretty quickly whether you’ve played something that works by the expressions on the faces of the other musicians around you! 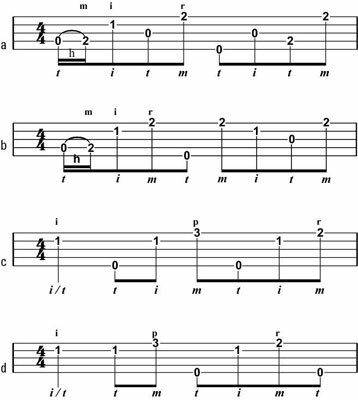 By listening to the audio tracks G Licks, C Licks, and D Licks (and using the tabs), play a group of essential licks for the G, C, and D chords — the three most frequently played chords in bluegrass banjo music. These phrases pop up time and again in the playing of Earl Scruggs, Sonny Osborne, and other bluegrass masters. G licks on the banjo. C licks on the banjo. D licks on the banjo. The process of adding licks to your musical vocabulary is a lot like adding new words and phrases when mastering a foreign language. In both cases, you expand the range of your expression as you internalize new things to say and new ways of saying them. 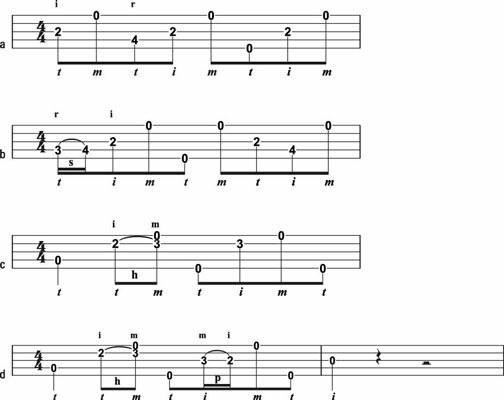 After a lot of practice, you can combine licks into original phrases and come up with your own unique musical thoughts.